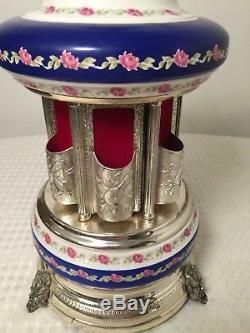 Vintage REUGE 13 Italian Porcelain Music Box Musical Cigarette Holder Carousel. 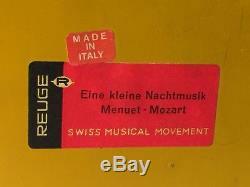 This is a large, 13 tall genuine Reuge. 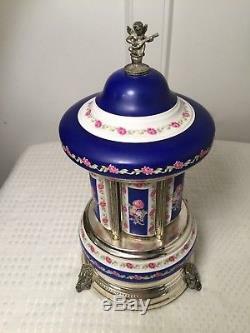 Cigarette carousel/music box in excellent working condition. 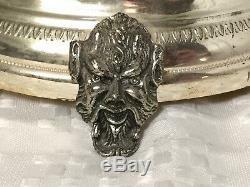 Wound up on the bottom and when a small button on the side of the piece is. Pressed, music plays and the 6 side doors slowly open completely revealing. 6 "pockets" lined with red fabric into which cigarettes are generally placed. Then, once opened for a few seconds, the doors slowly start to close again until. The next time the button is pushed. Once it is fully wound up on the bottom. The piece can go through several rotations of opening and closing before it needs. To be wound up again. 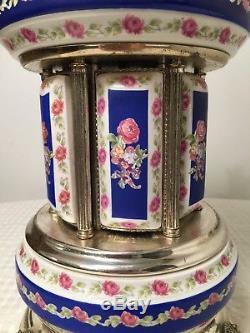 It is shown in the process of opening in photos #6-7 and is shown. Fully opened in photos #8-9. Made in Italy with a genuine Reuge Swiss Movement. 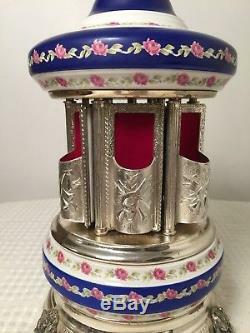 Music box which plays "Eine Kleine Nachtmusik" by Mozart. 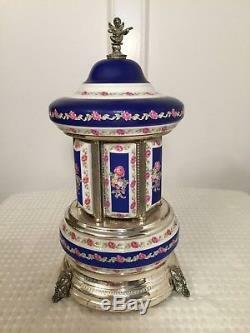 The piece is in overall excellent & clean vintage condition with NO cracks, chips or breakage. 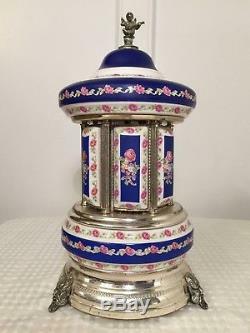 On any of the porcelain pieces. 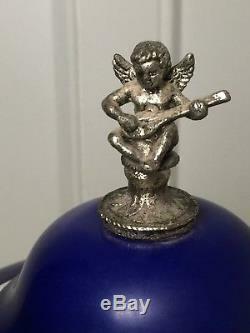 Just the lightest, typical patina on some of the silver metal. 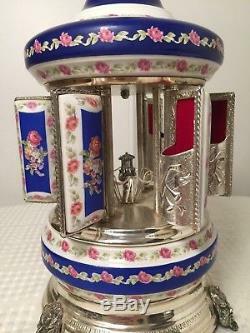 The item "Vintage REUGE 13 Italian Porcelain Music Box Musical Cigarette Holder Carousel" is in sale since Sunday, January 6, 2019. 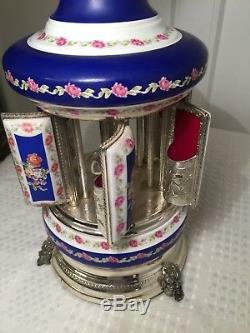 This item is in the category "Collectibles\Decorative Collectibles\Music Boxes\1940-1970".